Models will be sold under the Univega and Van Dessel brands. LAS VEGAS, Nev. (BRAIN) — Panasonic is working with Kent International to launch three models of e-bikes that will be sold under Kent's Univega USA and Van Dessel brands. 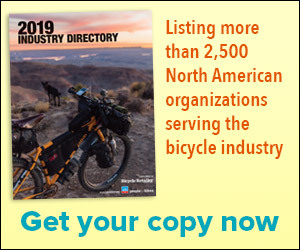 All the bikes will be powered by Panasonic batteries and motors and all models are being designed and assembled in the U.S.
COLORADO SPRINGS, Colo. (BRAIN) — USA Cycling has named Rob DeMartini as its president and chief executive officer. DeMartini joins the organization from New Balance Athletics Inc., where he spent the past 12 years as president and CEO. He will begin his new position in February. TAMPA, Fla. (BRAIN) — American Classic founder Bill Shook has launched a new mechanical design consulting business, Bill Shook Engineering LLC, serving clients both inside and outside the bike industry. SAN MARCOS, Calif. (BRAIN) — Mountain bike brand Eminent Cycles, sold largely consumer direct on the internet, is looking to expand its hybrid sales model and will attend this month's CABDA West show to meet with prospective dealers. BIG BEAR LAKE, Calif. (BRAIN) — Daniel Ellis Hanebrink died Saturday due to natural causes, his family announced. Hanebrink was an innovator in BMX, downhill mountain and fat tire bikes, among other areas. CHICAGO (BRAIN) — SRAM co-founder and longtime CEO Stan Day is transitioning to a new role as chairman of the company's board of directors as Ken Lousberg takes over as CEO. The change, announced to SRAM staff this fall, became effective Tuesday, Jan. 1. LONGMONT, Colo. (BRAIN) — 2018 started out with news of Niner Bikes' bankruptcy, which ended with the company being acquired by Huffy Bicycle's owner. VASHON, Wash. (BRAIN) — Charles "Chuck" Ivan Wurster, Jr., whose products helped create the current indoor cycling boom, has died at age 86 at his home here. HELSINKI (BRAIN) — The investor group acquiring Amer Sports has begun to buy up the company's outstanding and issued shares through a voluntary recommended public cash tender. MADISON, Wis. — Almost three decades after acquiring Graber Products and renaming it Saris, co-founder Chris Fortune is stepping down as president and handing the reins to COO Jeff Frehner. Fortune becomes Saris’ CEO effective Jan. 1, 2019. STOCKHOLM (BRAIN) — Thule Group announced this week that it has acquired car rooftop tent maker Tepui Outdoors Inc. for $9.5 million. LONDON (BRAIN) — U.K. online retailer Chain Reaction Cycles has announced on its website that it will stop selling Shimano products into North America on Jan. 1. LONG BEACH, Calif. (BRAIN) — The online cycling platform Zwift has secured a $120 million Series B investment. The company, which started with a gaming-style virtual riding experience, has expanded into a running game and non-gaming indoor training options.